Columbia-TriStar, widescreen 1.85:1/16x9, standard 1.33:1, languages: English Dolby Stereo [CC], Portuguese Dolby Stereo,, subtitles: English, Spanish, Portuguese, Chinese, Korean, Thai, single side-single layer, 28 chapters, talent files, original "Help Cat" theatrical trailer, bonus trailer, vintage advertising, rated NR, 109 min., $27.95, street date 12/14/99. Academy Awards: Nominated for Best Art Direction-Set Decoration, Best Costume Design, Best Film Editing, Best Sound, 1958. Directed by George Sidney. Starring Rita Hayworth, Frank Sinatra, Kim Novak, Barbara Nichols, Bobby Sherwood, Hank Henry. A womanizing singer finances his own nightclub through the "sponsorship" of a wealthy widow in Rodgers and Hart's classic musical, Pal Joey. I won't attempt to hide the fact: I really don't like musicals. As a kid, I adored them, but one day something clicked and I developed a virtually opposite viewpoint; I guess all those voices inside my head finally got to me! Despite that disdain, I actually rather enjoyed Pal Joey, a comedic musical from 1957 that stars Frank Sinatra, Rita Hayworth and Kim Novak. Maybe this is because it doesn't follow the usual "people stop talking and sing what they're thinking" mode; while the film boasts a plethora of tunes - many of which are quite well-known - most all of the songs appear as parts of stage performances. Maybe I liked PJ just because it offered a charming and witty experience. The plot seems pretty worn; it's your basic love triangle deal, with Sinatra in the middle as the sharpie who can't decide between his head and his heart. Still, the production is executed with flair and panache, and the performances all seem winning. Especially strong is Sinatra's turn as Joey. While I can't say that Frankie displays a whole lot of emotional range in the role - don't expect much heart-wrenching agonizing to occur - Sinatra maintains such a crisp, snazzy personality that he makes his moments go a long way. I'd guess that this film probably could have stunk without Sinatra; his flair makes it as successful as it is. Sinatra's the only leading player in the film; Novak and Hayworth play supporting roles. So why's Hayworth receive top billing? According to the production notes, this occurred at the insistence of Sinatra, because Columbia Pictures made a name for itself due to Hayworth's popularity. Who knew Frank could be so deferential? Anyway, both Hayworth and Novak seem quite appealing in their roles. Although she neared the age of - gasp! - forty at the time, Hayworth remains the stunningly sensual presence we saw in earlier years, and she's able to maintain the snooty iciness necessary for the part. Novak convincingly portrays a semi-naive ingenue who cuts through Joey's cynicism and blather. Granted, as is typical in these kinds of films, it's never terribly apparent why Joey favors Linda instead of all the other women who fawn over him - though I suspect the fact she doesn't fawn may play a part - but Novak seems so appealing that we don't question this decision. Pal Joey isn't a classic film and doesn't offer much that can't be found in the plots of about a jillion other films. However, those films don't feature one Francis Albert Sinatra, and though I've never been a fan of the man, he portrays our rather sleazy lead character in a very charming and witty manner. Add in fine performances from the supporting cast and you have a surprisingly entertaining little flick. Another day, another fine transfer on a Columbia-Tristar (CTS) DVD. 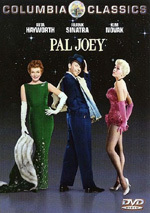 Pal Joey appears both in its original theatrical aspect ratio of 1.85:1 and in a fullscreen version on this double-sided, single-layered DVD; the letterboxed edition has been enhanced for 16X9 televisions. PJ seems inconsistent but generally strong. Sharpness looks quite crisp for the most part, though some haziness occasionally interferes with the image; the film stock of the day tends to look vaguely blotchy at times, and that occurs here. Jagged edges pop up from time to time but seem minimal. The print used appears pretty good for an old movie. I noted some general speckling at times and some rare scratches or marks. Grain is a bit of a problem, though, and appears more frequently than I'd like. Colors stand out on this DVD and are terrifically brilliant and bold. A musical such as this demonstrates a variety of hues wonderfully; colors look flamboyant but stay true and lack bleeding or other problems. Black levels also look deep and rich, and shadow detail generally appears appropriately heavy without any overly opaque tones. The only exceptions to that rule are the always-problematic "day for night" shots, which seem much too dense. Despite some flaws, Pal Joey makes for a very satisfying visual experience. While not as strong as the picture, the film's monaural soundtrack also is generally pleasing. Dialogue seems clear and easily intelligible at all times, and effects are clean and smooth; at no time did I discern any hints of distortion. The entire track seems somewhat tinny and lacks depth, but that appears due to the weak sound recording technology; dynamic range will almost always be limited on films of this era. The music, which is obviously important for a film such as PJ, sounds generally adequate, but could probably use a remaster from the original tapes; that would have really this track to like. As it stands, the audio for Pal Joey seems perfectly adequate for a film of its vintage. Pal Joey contains a few supplements, but not much. The film's entertaining theatrical trailer appears, as does one for Hayworth's The Loves Of Carmen. The "Vintage Advertising" section displays three posters for the film (two US, one French), and the "Talent Files" offers biographies for the three stars and director George Sidney; as is usually the case with CTS DVDs, these are rather limited in information and border on uselessness. Finally, some brief but informative production notes appear in the DVD's booklet. I expected to dislike Pal Joey, but a number of factors - mainly Frank Sinatra's fine performance - won me over and I found it to offer a light but pleasant and charming experience. The DVD provides pretty good picture and sound, though it skimps on supplements. Despite that last disappointment, Pal Joey will be greatly enjoyed by fans of musicals or any of the stars, and even musical-hating bastards such as myself may get a kick out of it. Definitely worth a rental, and you may want to consider buying it.